"THEN THE MAN CONAN SEEMED SUDDENLY TO GROW UP IN MY MIND WITHOUT MUCH LABOR ON MY PART AND IMMEDIATELY A STREAM OF STORIES FLOWED OFF MY PEN OR RATHER, OFF MY TYPEWRITER ALMOST WITHOUT EFFORT ON MY PART." The Conan Gamemaster's Toolkit inspires the creation of thrilling plots, unforgettable characters, and unexpected twists in the vein of Robert E. Howard's singular vision. Generate ideas for exciting action set-pieces, antagonists, scheming machinations, and weave them into a story all your own. 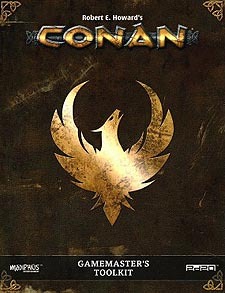 Within this resource is a host of rules references for ease during play, as well as a four-panel gamemaster's screen packed with essential tables from the Conan corebook. Here you have all the tools needed to bring Howard's world to life. Dip your quill into that deep reservoir of imagination, and write adventures to turn your players' deeds into legends worthy of Conan himself! A full gamemaster's screen, including the most relevant tables needed during play. A 32-page toolkit filled with random tables and tips to inspire and inform the creation of antagonists, adventures, and dramatic plots! A squad sheet, allowing the gamemaster quick reference for groups of enemies to overcome. The stunning art of Brom, spread across four panels. This book requires the Robert E. Howard's Conan: Adventures in an Age Undreamed Of corebook to use.